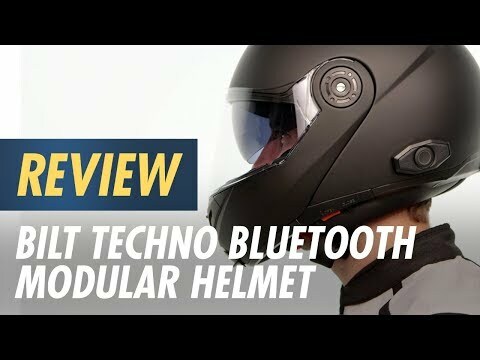 With the addition of Sena’s DWO-5 Bluetooth technology, the BiLT Techno 2.0 Bluetooth Modular Helmet continues its reign as the most technological modular helmet on the market. Ready-to-go right out of the box to sync with any Bluetooth-enabled device, the Techno 2.0 also has great ventilation, a removable liner and a drop-down tinted sun shield all in a convenient modular design. Note: We have found this helmet fits 1/2 size smaller than the size chart indicates. I purchased 1 for myself and 1 for my wife. The fit is snug but like the Bilt one I believe it will work it's way to be comfortable. This helmet is a BIG improvement Bluetooth wise. It has a Sena Bluetooth and not the junk that was in the first series helmet. Helmet to helmet pairing for talking to my passenger is clear and loud. It works good with my Samsung phone which is mounted dead center on my handlebars. It hears commands for music, navigation and phone calls. My one complaint is that it is suppose to send my music back to my passenger which it does when we are off the bike. When we get on the bike the music stop to the passenger. My guess is the signal is not making it through my body to the rear helmet with bike running or turned off. The pairing still works. My solution to this is to let my wife use her own cell phone to play music. So at this point I have 2 cell phones running to 2 helmets independently and the good news is the helmet to helmet still works fine. Hope Cycle Gear reads this and has an answer for me as Sena will not talk about their system in the Bilt helmet. Sena cannot even tell me a model number of the bluetooth. At this time the Sena Device Manager will not work for updates and bluetooth control on your PC. Cycle Gear says maybe down the road the helmet model will show up as an option on the Device Manager. Bilt sizing table recommended a XL for me and a XS for my wife, but when we tried them on I needed the XXL and she needed the S. Even the XXL is tight, but they don't make a bigger helmet. I wear a 7.5in hat normally for reference. Helmet noise barrier under the chin when closed came loose on the first ride. Don't hold the helmet by that thin fabric piece. The helmet is narrow and squeezes the cheeks big time. Sena Bluetooth headset works well, but volume is hard to get right. Phone calls are too loud but music is too low. For the money you can't beat this helmet. Best value per dollar, in my opinion. Sena Bluetooth built in. (Have to use cyclegear's software manager as sena's will not communicate) Tight fit at first, but breaks in quick. Decent airflow for the few vents it is equipped with. Visor fogs on cold days but that can be fixed. Comes with a drop down tinted visor so no need to carry a spare or sunglass. Wind noise is way less than expected from a modular helmet. Would buy again and again. It has all the best features in one helmet. The Bluetooth works great. Do wish it had a little more bass in the speakers. Bluetooth is very clear even over my loud pipes. Best buy for your money. That is rare now days. Would buy again for sure. Liked it so much I got my wife one to match. Truly a life saver!!! No joke! The helmet has been great for me after about a month of having it. The ONLY thing that I'm not a fan of, my wife isn't either, is that after about an hour of riding, your head hurts to the max. Hopefully it'll loosen up! Great for the price!! Bought this helmet August 1, 2017. I rode with it on for three rides. On my third ride August 23, 2017, I made a gas stop and reached to open the modular front and could not find the release. Somehow during the ride the button fell off. Very uncomfortable pulling this off. I will update when I try to return it. The noise level is horrible and felt no air flow through the vents. This helmet replaced my 6 year old HJC modular helmet that I had no issues with. The opening and closing of the helmet seems awkward at best and putting the sun visor up and down isn't very smooth/easy. The HJC modular was far superior. Tried this helmet on at cycle gear. Liked the Sena Bluetooth option. They didn't have a medium so I ordered it online. It came in about 4 days, pretty quick. I have had a modular helmet made by GMAX for about 3 years. 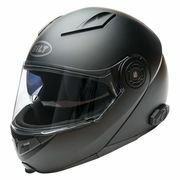 Comparing the quality of it to the Bilt helmet is why I'm writing this review. 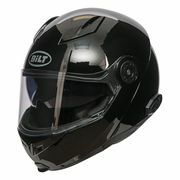 The bilt helmet fits snug and does seem to hurt after about an hour, it does have thick padding, a plus. It will probably loosen up after a while. The internal visor is paper thin and chinsey ( Cheap), Comparing it to the thick and heavier visor or sunscreen in the GMAX. The modular part that the chin makes up is really thin material on the Bilt. It is thicker and heavier on the GMAX. And the GMAX has more venting. 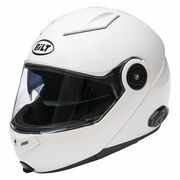 Overall the GMAX is heavier and seems better quality helmet than the bilt for 100 dollars or so less. With that said both helmets have the forehead section of the helmet hollowed out for the sun visor. The Bilt does have the Senna Bluetooth which is a plus. it is loud enough for highway riding and is easy to pair to my Droid smartphone. However I went out and bought a Garmin 5" LMT EX GPS and when trying to multi pair with it the Sena said it was not compatible, so I returned the GPS. I paired my phone and was able to listen to my amazon music and GPS on my phone at the same time. Called Sena support and they said to multipair you either need HFP or A2DP on the GPS. So I was disappointed about that, not ready to Spend 400- 800 dollars on a Nuvi or Zumo. So for now I'll use my phone. 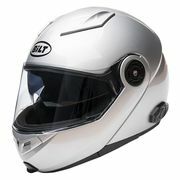 Overall the Bilt helmet is Cool for the price with the Bluetooth but lacks quality. 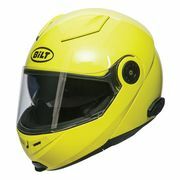 The Bilt modular helmet on sale for 249.00 seems heavier and cooler looking but I was told that Bilt made this helmet for a longer time and is a lighter helmet. I guess for the money it's ok but don't know how it would hold up in a crash. Hopefully I will never find out. I would recommend it but just disappointed when compairing it to the GMAX Quality but GMAX doesn't have Bluetooth. Pro: Nice looking helmet, bluetooth connection was easy and works well with phone, vision is OK for a full face, Like the face shield and sun shield. Cons: Fist, this is the first full face helmet I have ever tired on and not sure I like closed it. The helmet runs much smaller than expected. I measured between a med and Large but purchased an XL and find it to be a really tight fit on my cheeks. I thought it would wear to fit but so far no luck. Looks like I have to order XXL cheek pads to be able to open my mouth after 4 hours of wearing. I have tried both the Sena and Cyclegear apps to upgrade my firmware, but neither of them will recognize myBilt Techno 2.0 Sena Bluetooth Modular Helmet. Windows does, it shows up in device manager, but not in the application. Any suggestions? Thanks! My IPhone works and I can get calls great. how ever I can not listen to my music I have down loaded on my iPhone , I cant even listen to Pandora. is this normal? is their a solution? BEST ANSWER: There is a way to sync your phone to your helmet to only take calls, to only listen to music, and for both. The instruction manuel explains how to set up for each one. If you've already synced your phone to your helmet for both calls and music and it's still not working properly, try making sure your phone is connected to the helmet as an audio AND phone calling device. I know for android there is an option for this in the Bluetooth menu. BEST ANSWER: No. It is a modular design. It will not pass Snell testing for that very reason. No modular helmet on the market has a Snell certification. You need to do some research before misinforming the masses. It is only DOT certified. Modular helmets will not currently pass SNELL certification requirements. Doesn't mean it's not safe, just won't pass their testing requirements. does techno have am fm radio? BEST ANSWER: no it does not ! Beware these are sized very small . Sizing chart says 56 to 58 is med I,m 56 and to tight. None of the Sena apps will work ! This from the rep on the phone for sena . which is why theres no fm radio . Besides these few major problems seems good quality! No FM radio. Have to use cyclegear download manager for configuration. It is a Sena product Bluetooth installed. Size is pretty close to true for me. I think it all depends on the shape of your head. i wear glasses. Can i wear this helmet and use the sun shield? I don't wear glasses, but I just put on a pare of standard sunglasses and the sun visor was far enough away not to touch the glasses. I JUST received my helmet last evening via UPS! To answer your question, YES !! I also wear glasses and there is absolutely NO interferance, no bumping, not even close! The inner sun shield pops up and down very easily! A word of warning - I wear a 7¼ size had, and the measurements confirmed it. Medium is the top end for this size in the table, so, I ordered a Large. The Large IS TIGHT! I would suggest the XL if your head size is close to mine! They say a helmet is suppose to be snug, and mine Really is SNUG! The inner protective material gives full contact all around the skull and cheeks. If, God forbid, I had to "put it to the test", I am guessing that it would protect better than having a helmet thats flopping and rolling around rather than doing what its suppose to do - take the blow and absorb it! I do not wear glasses, so I can not speak to your question directly. I do believe that there is sufficient clearance for eyewear behind the drop down sun shield. A correctly fitting helmet is snug on your head, so I am not sure how glasses would fit width wise. May want to find a place to try helmet on to verify. Hope this helps ! I would say that you could. I've had the helmet for about a month now and it's been great. Would love to answer any questions that you might have. Do they make this in a 3xl? BEST ANSWER: I think so. They seem to run small. My Harley helmets were XL, but I needed a 2X for this one. Does this helmet have a replacement liner? BEST ANSWER: Not sure but the liner comes out for washing. I wash mine by hand with mild dish soap. You can probably wash it on gentle in a wash bag by machine, but I prefer not to. I wear a du-rag or cotton cap to keep it clean and from sweat. Call cycle gear for your question as they are very good. The Helmet is not connecting to my iPhone 8 is anyone having this problem? BEST ANSWER: Connects to my Samsung Note 4 and Google Pixel. Read manual carefully and Google it. Remember you have to do something on the helmet and the phone. If you had other phones connected, a reset may be in order. I have just done a Firmware Update on my helmet. Hold center button for 12 sec to put helmet into pair mode. Continue to hold the center button to go into universal pair mode. Once in universal pair mode let go of button then tap the center button once. Make sure phone is in pair mode. What speakers would fit in this helmet as and upgrade? Common seems to be 42mm. Is this the same for this helmet? BEST ANSWER: they are built in already. What is the helmet's protective material made of?